An interesting insect has been found in some gardens recently. The clavate tortoise beetle, Plagiometriona clavata, is about a ¼ inch long or a little smaller, mostly round, and turtle-like. A thin, opaque, shield-like structure extends from the body and covers the head. There is a distinct brown figure on its back that somewhat resembles an animal. 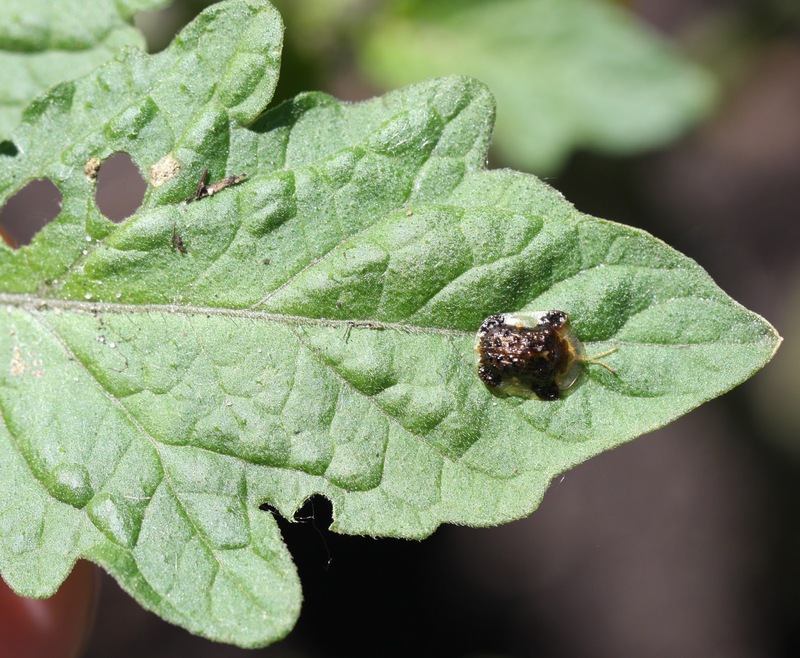 This tortoise beetle has been reported this year feeding on tomato and eggplant. They can also feed on other Solanum spp., such as potatoes. In the past, the clavate tortoise beetle has been found on Chinese lantern. The literature also records this insect on jimson weed Datura stramonium and ground cherries, Physalis spp. When these beetles feed, they create roundish holes in the interior of the leaves. Fortunately, this beetle typically occurs in just small numbers and rarely, if ever, causes significant defoliation to plants. If these beetles are found in your garden, physical removal should be the only necessary control. They are mostly just a curiosity. I have seen several of these this year in my garden, south of Hastings. Very neat looking creature! Unless you have a small garden, I suggest you just leave them be.